This magazine is largely the work of Cheryl Morgan. However, the magazine would not be possible without the hard work of several other people. Kevin Standlee provides encouragement, enthusiasm and the occasional article. He also distributes paper copies of the magazine at the Bay Area Science Fiction Association. Anne KG Murphy has been our proof reader since 2001. Recently she has started contributing reviews and convention reports in addition to her proofreading. During the day she's a human-computer interaction design engineer in Ann Arbor, MI. Combined interests in SF and collaborative creation got her involved in running science fiction conventions; most of her writing and editing is related to either SF or conrunning. You can find out more than you ever wanted to know about Anne at her website, or her LiveJournal. Tony Geer designed the masthead at the top of each page of the site and provides general advice on web site design. 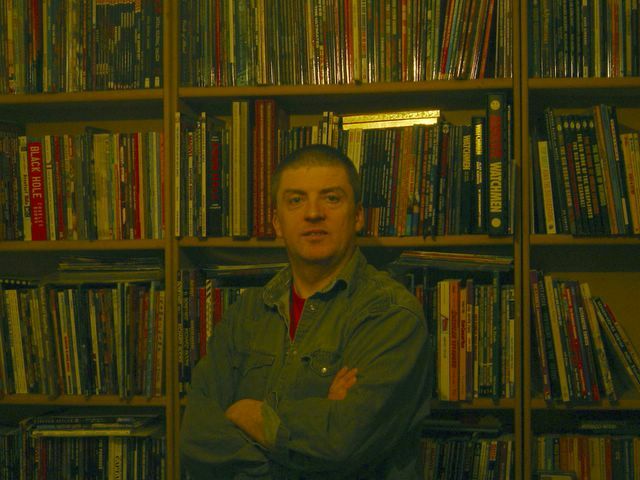 Our Official Comicbook Correspondent, Stuart Carter lives and works in London. A well-meaning but lazy soul with an inherent mistrust of jazz and selfish people, he enjoys eclectic "indie" music, a dissolute lifestyle and original written science fiction, quite often simultaneously. His wife says he is rather argumentative; Stuart disagrees. Stuart's web site is (not to be confused with) The Truth. Nic Clarke grew up in a nether region between Lancashire and Yorkshire, dividing her time between climbing trees, reading every fantasy novel she could get her hands on, and brass band contests (it being, of course, Grim Up North). She currently lives in Oxford, where she is working towards a PhD in medieval Islamic history - and still reading (nearly) every fantasy novel she can get her hands on. She spends too much time wittering on at Eve's Alexandia, and used to do book reviews for SFX. Joe Gordon has been a bookseller going right back to the days when he still had hair (on his head at least), with a speciality in SF&F, graphic novels and (just for some variety) Scottish history. He works on the main webstore and maintains the SF and comic-themed blog for Forbidden Planet International, has contributed for years to The Alien Online, talks nonsense on the radio infrequently and throws random pieces together on his trouble-making personal blog, the Woolamaloo Gazette (from book reviews to political sarcasm, sometimes in the same post). He would like to be thought of as a child of the Scottish Enlightenment, which means he uses the fact Robert Louis Stevenson drank here as a good excuse to go to an Edinburgh pub. Mario Guslandi lives in Milan, Italy. Most likely the only Italian who regularly reads (and reviews) dark fiction in English, he’s written reviews for a number of genre websites such as The Alien Online, The Agony Column, Infinity Plus, The SF Site, Necropsy, and Horrorworld. John Hertz lives in Los Angeles. He has pursued science fiction as a hobby for several years. The participation and interaction in our community rouse his sense of wonder. He was given the Big Heart Award at the 2003 World Science Fiction Convention in Toronto. He drinks Talisker. Victoria Hoyle is currently a postgraduate student in Medieval Studies at York, UK, where she lives with her partner and two guinea pigs. She reads as widely as she can, both in genre fiction and out of it, but with a penchant for the weird and small press.She writes occasional reviews at FantasyBookSpot and often posts to a "lit" blog - Eve's Alexandria - which she shares with four friends, including Emerald City's short-fiction reviewer Nic Clarke. Lucy Kemnitzer is a sometimes teacher of at-risk adolescents and an aspiring writer of what she calls hard sf and hard sf fans call soft sf. As a middle- aged member of the lumpen intelligentsia, she has more time than she uses. Her children are grown but not flown and she's still married to that nice fellow she met back in the Ice Age. Juliet E McKenna has been fascinated by other worlds and other peoples since discovering folk tales, ancient myths and fantasy fiction shortly after learning to read. Classics offered the best way of combining all of these in a degree, which she studied at St Hilda's College, Oxford. While at university, she also took up table top and live role playing as well as Aikido, a Japanese martial art based on principles of defence, developed from ju-jitsu. She still enjoys these hobbies, together with reading a wide range of fantasy and SF, crime fiction and thrillers. Her tastes in film and television are similarly inclined. She worked in human resources management before making a career change to combine book-selling and motherhood. Her first novel, The Thief's Gamble appeared in 1999. That was the first of the highly successful Tales of Einarinn series, now translated into more than a dozen languages. This has been followed by The Aldabreshin Compass sequence, beginning with Southern Fire. Other works have included short fiction for Doctor Who anthologies and a novella, Turns and Chances. Living in Oxfordshire with her sons and husband, she fits in her writing around her family and vice versa. This multi-tasking keeps her firmly rooted in reality, something always essential for the professional fantasist. Not taking life or herself too seriously is also vital. Juliet is a member of The Write Fantastic, an authors initiative to promote fantasy fiction. Karina Meerman is a freelance journalist who lives in the Netherlands with Boyfriend and Dog. For money, she writes about technology & lifestyle for trade magazines and business publications. For love, she writes about SF&F for whatever publication will have it. In the Netherlands, that is usually Elf Fantasy Magazine. Not so long ago, Karina decided she wanted to become the main SF/F journalist in the Netherlands. A major achievement in that field so far, has been to sit next to Dave Langford in the Moat House bar at her first WorldCon in Glasgow in 2005. She hopes some of his knowledge has rubbed off, but suspects she may not have been sitting close enough. Karina's business website, in Dutch, is www.karinameerman.nl. Her weblog, in English, is called Brain of nerd, body of woman and can be found here. P�draig � M�al�id is a middle-aged Irishman with an Alan Moore obsession. He has a ridiculously large collection of Graphic Novels. (photo here, and list here.) He also knows far too many things about the history of Miracleman, which he intends to get down on paper some day. He likes to write, preferably things that require insane amounts of research, which is one of his favourite activities. When he�s not being obsessional about the works of Alan Moore, he occasionally finds time to update the news section of Irish Sci-Fi News, as is currently working on his first fanzine, to be called Puny Earthling. He is married to The Lovely Deirdre, the most patient woman in the world. Peter Wong lives in San Francisco, California. His Day Job gig pays for such necessities of life as books and Criterion Collection DVDs. Otherwise, thanks to the judicious use of applied physics, he somehow manages to keep semi-reasonable track of the city's many alternatives to Hollywood's offerings. Readers of the Comix Experience newsletter "Onomatopoeia" see the results of his regular keyboard bouts of QWERTYUIOP wrestling in his column "Lost In Pictopia." Many other fine writers contribute to Emerald City from time to time. Here are some brief bios. Matthew Cheney has reviewed for Locus, SF Site, Rain Taxi, and The Internet Review of Science Fiction. He is a columnist for Strange Horizons and maintains a weblog, The Mumpsimus. Hal Duncan lives in Glasgow, Scotland and is a member of the Glasgow Science Fiction Writers Circle. His debut novel, Vellum, has just been published by Del Rey, the first in a diptych called The Book of All Hours, which will conclude in 2007 with Ink. He has had short work published in various magazines and anthologies -- Strange Horizons, Electric Velocipede, Nova Scotia -- and various samples of fiction and critique are available at his website. Farah Mendlesohn is Editor of Foundation, and author of the forthcoming Rhetorics of Fantasy from Wesleyan University Press. John Shirley is the author of many novels and story collections; he is also a screenwriter (The Crow), and a professional lyricist. His most recent novels are Crawlers, from Del Rey books, and The Other End, forthcoming this summer from Cemetary Dance books. His novels include City Come-A Walkin', Eclipse, Eclipse Penumbra, Eclipse Corona, and A Splendid Chaos, the latter out in a new edition from Babbage Press. He won the Bram Stoker Award for his story collection Black Butterflies. With Bruce Sterling, William Gibson and Rudy Rucker he is regarded as one of the seminal cyberpunk writers. He is also the author of the nonfiction work, Gurdjieff: An Introduction To His Life And Ideas, from Tarcher/Penguin. His blog and a very active message board are at www.johnshirley.net. Karen Traviss is the British author of the critically-acclaimed Wess�har series from HarperCollins. She also writes Star Wars fiction including the Republic Commando and Legacy of the Force series. A former defence correspondent and TV and newspaper journalist, she lives in Wiltshire. Website: www.karentraviss.com. Jeff VanderMeer is a two-time winner of the World Fantasy Award, and has made the year's best lists of Publishers Weekly, The San Francisco Chronicle, The Los Angeles Weekly, Publishers' News, and Amazon.com. His fiction has been shortlisted for Best American Short Stories and appeared in several year's best anthologies. Books by VanderMeer are forthcoming from Bantam, Pan Macmillan, and Tor. Jeff has a blog at http://www.vanderworld.blogspot.com. A longtime reviewer for Locus magazine, Gary K. Wolfe is also a professor of humanities and associate dean at Roosevelt University in Chicago and the author of several critical studies of science fiction and fantasy. His most recent book is Soundings: Reviews 1992-1996 (Beccon). Huge thanks are due to all of our staff, without whose help and encouragement this magazine would not exist.